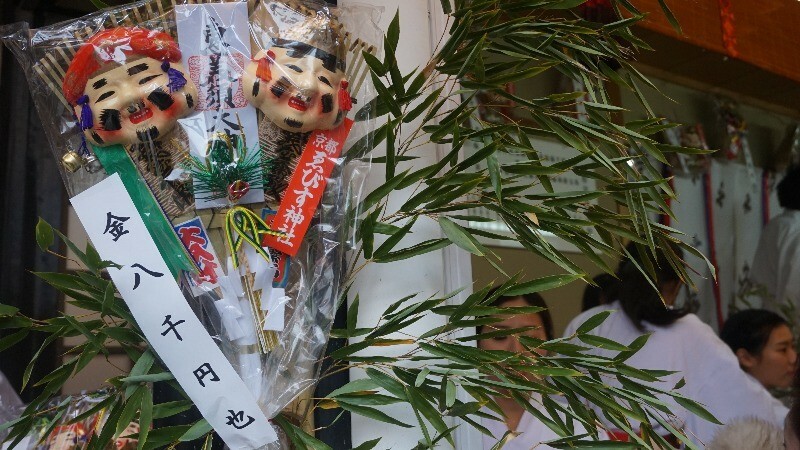 Time to pray for wealth and prosperity at the Toka Ebisu Festival! Every year on 10 of January you can see many people come pray for the success of their company for the starting year. So, of course, we from Sharing Kyoto also went to the festival! This festival takes place one a year on January 10th, and it’s a big event in Kyoto. At this event, you can pray for the success of your business, and this is the reason why many CEOs and people working in companies visit the festivities. A year went by, and this is what our bamboo branch looks like in 2018. 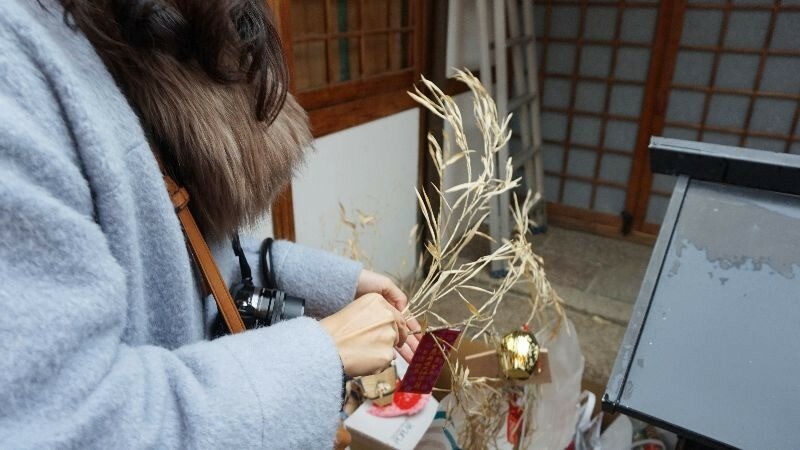 So Vanessa decided to do the proper thing, and return the bamboo branch to the shrine, and pray for prosperity for Sharing Kyoto in 2018. 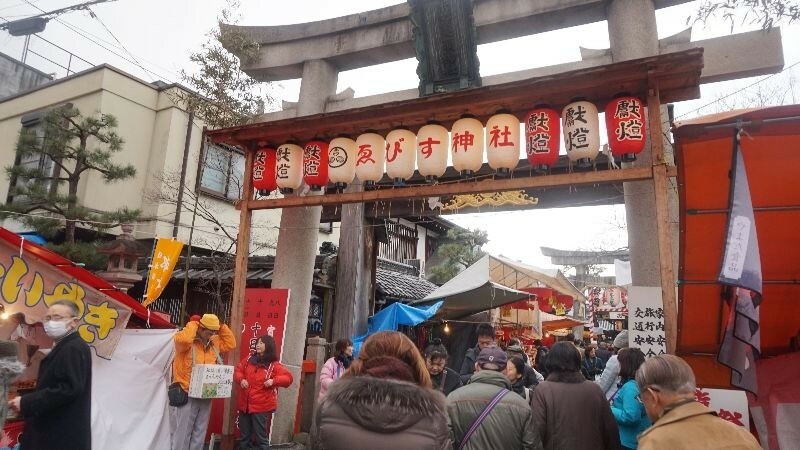 Although it was very cold, there were many people on the streets close to the shrine. You can enjoy all kinds of street food when going to the festival. After walking for a while, we saw the lanterns welcoming us to Ebisu Shrine. We were not the only ones heading to the shrine, and it was rather crowded. There was a place where you could leave the bamboo branch you bought last year, so we left our old one there. 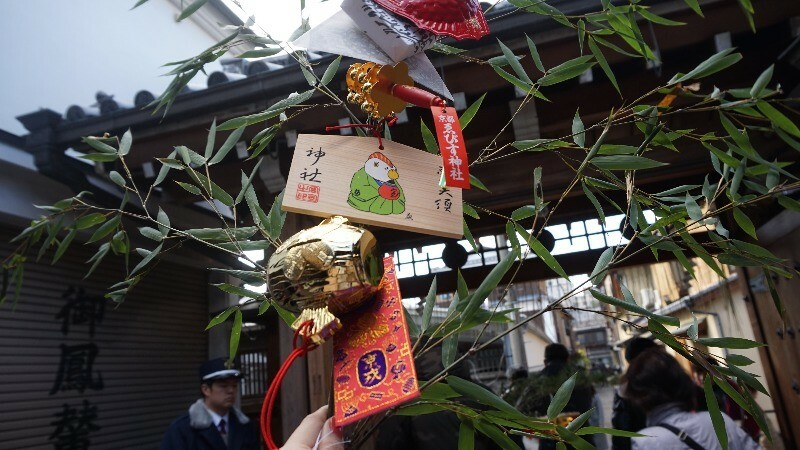 When putting the bamboo branch into the box, you have to be thankful to the god of luck, Ebisu, and also hope for a great new year. 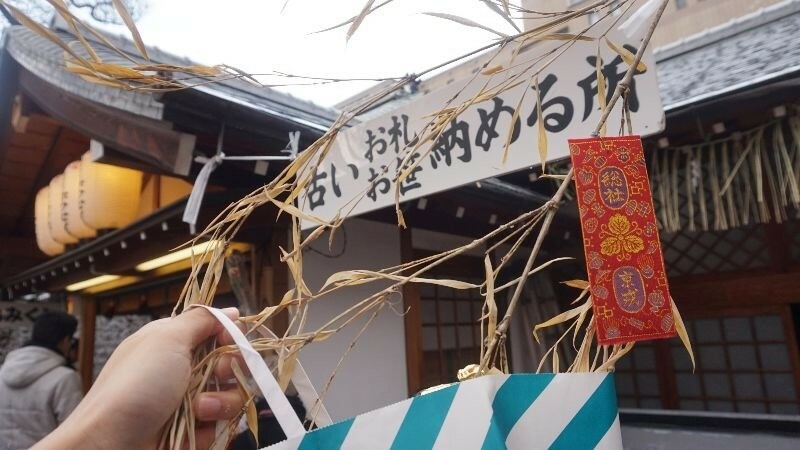 And at this place, you can receive a bamboo branch from an actress of Toei Movie Studio, and there’s even a shrine maiden dancing in the background. This sight made me feel very calm and made me forget being in the middle of a crowd of people. 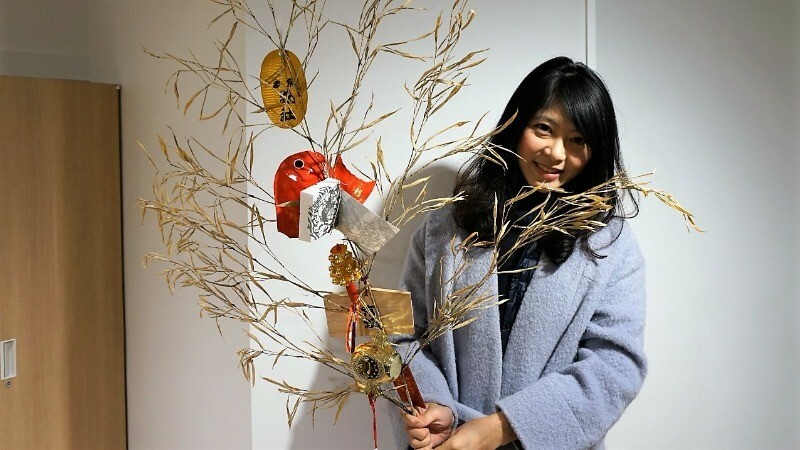 After receiving the bamboo branch, you can buy all kinds of ornaments for it, and they all have a meaning behind them. The shrine maidens can help tell you what kind of effects they have guaranteed of course that you speak Japanese. 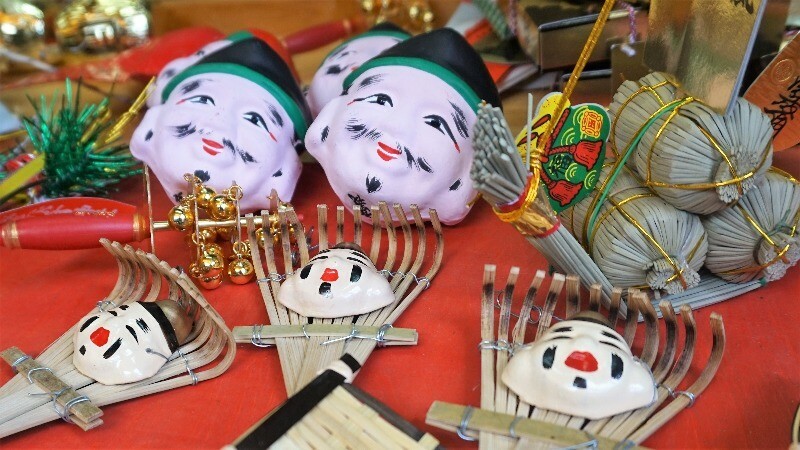 They also have readymade sets with many Ebisu-related ornaments on them, so if you can’t choose, get one of these for the most powerful financial luck as possible! I really wanted to buy one to take back to the office. After this, the only thing left on the agenda is to knock this wooden board and make a wish. So I lined up and knocked the wooden board gently while making my wish! I hope it’ll come true! 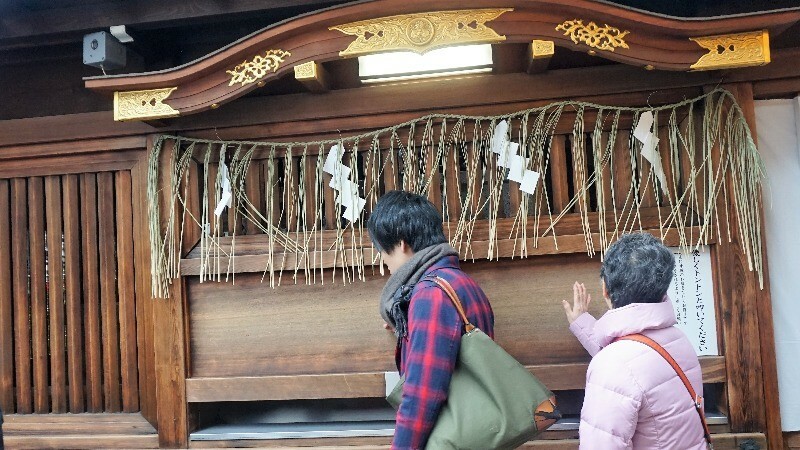 Every year on January 10 there are Ebisu festivals all around Japan, and businessmen flock to these events to pray for a good year, business-wise. 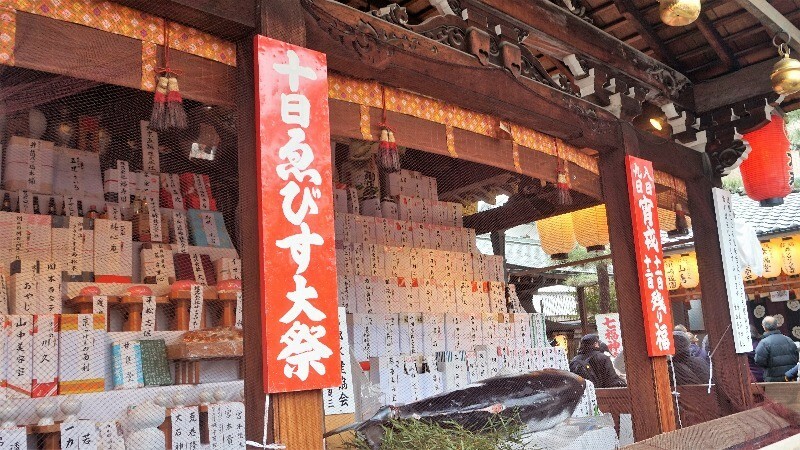 If you want to increase your assets, how about heading to Ebisu Shrine! I hope you’ll have a successful year! This was the first time for me to take part in this festival, but I found it very interesting. 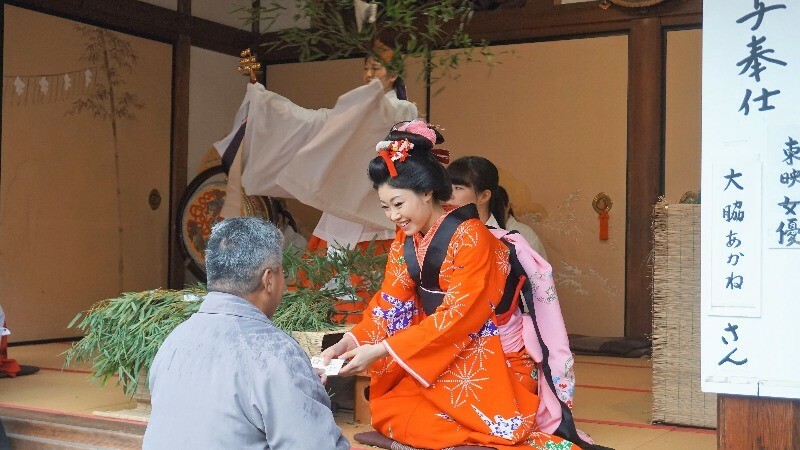 Everyone seemed to be wanting to come here to pray for prosperity, from unhurried old people to CEOs expensive suits, so this is an interesting festival to experience Japanese culture at its best. My wish for the new year was also to make a lot of money!